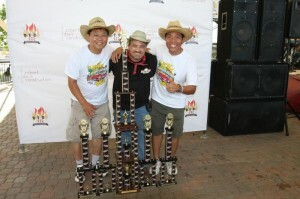 What was unique about this July 4, 2009 KCBS contest is that we won 1st place in all four meat categories. It’s been conveyed to us that KCBS officials from Kansas City have confirmed that this is the first time in America that a team has accomplished this feat at a State Championship and Team of the Year (TOY) event. There is now talk that Mark and I might get invited to Kansas City to be recognized during the KCBS annual awards ceremony. Congrats to Steve of All Hogs Go To Heaven for RGC. 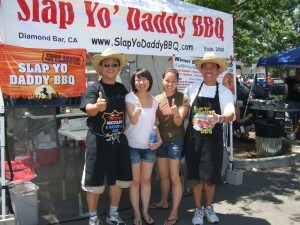 It was great to see our NorCal BBQ friends again and cook with them. 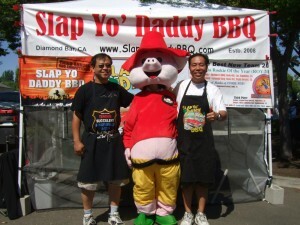 A special shoutout goes to Tim and Gina from Mars Mobile Grill who had an embedded Sacramento Bee reporter Stuart Leavenworth who was getting a front row seat learning how to BBQ from Tim (Blog 1, Blog 2). Our friend Howard Chi walked for the very first time for Chicken and Brisket. More importantly, Howard sent a couple of his top dental interns to help us dish out People Choice. Nice! And it was awesome to see the Chris and Bekah Juencke, our friends and local-Stockton team, take 1st Place People’s Choice honors. Great job! And, it was great to catch up and hang with the rest of the BBQ contestants like Too Ashamed to Name, Ric-less Ribs, BLQUE, and others who came, and make new friends like the Wahoo n KJ folks. As requested, the Smoking Yankees BBQ mascot stopped by and we couldn’t help but take a picture with their always-ready-to-please-with-a-picture mascot! The KCBS presentation box making clinic I conducted on Saturday morning was well attended. 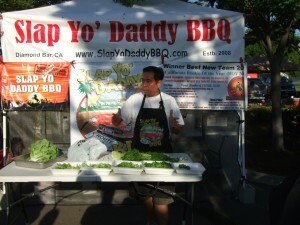 I showed how we make our Slap Yo’ Daddy Lazyman Boxes using only 1 head of lettuce and 3 heads of parsley to make 4 turn-in boxes in 15 minutes while spending less than $3.50. Several teams told me later that they abandoned their time-consuming and expensive method and did their boxes our Lazyman way after the demo. The fire works show on Friday night was right in our faces above the BBQ contest sight so everyone got an excellent view. Major kudos to Ric and Ben who worked tirelessly as organizers to ensure that every detail was taken care of including working with the Fire Marshal, Health Dept, and Event Security to untangle the snafus and keep things moving along. Many thanks go to all the helpers, volunteers, and sponsors especially Bekah Juecke’s boss who was the main sponsor. Thanks to K&K also for officiating this event. 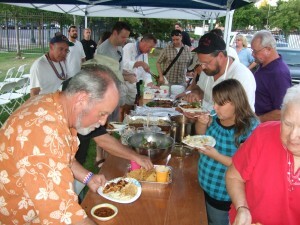 The Friday Night potluck was well attended and there were lots of goodies. Dave and Deni’s chili was superb and so was the BBQ corn with Chipotle Lime Butter! 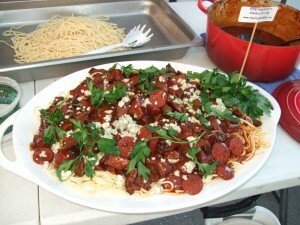 Our BBQ Spaghetti with Smoked Tri Tip with Andouille Sausage and Gorgonzola Cheese and Italian Parsley went really fast despite the 2 lbs of spaghetti I cooked! Despite my experience as a second year head cook, I screwed up on my brisket purchase. I bought 3 briskets from Restaurant Depot for my next three contest, froze two, and took the third to Stockton. On Friday when I was prepping my brisket, I noticed that it wasn’t a brisket but a beef bottom round! Luckily, Mark and I dashed to Save Mart and got a replacement brisket in time. 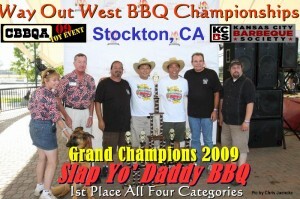 I’m going to smoke the bottom round for the Santa Maria potluck next Friday. Next time when I purchase meat, I’ll pay more attention to the meat label! See everyone at Santa Maria this Friday!